ODEON – the UK & Ireland’s leading cinema chain – has today revealed London will soon be home to three of its new ODEON Luxe cinemas, offering London film fans exciting new, fully-reclining venues to enjoy the latest films in luxury – just in time for Christmas. ODEON Luxe Swiss Cottage will officially launch to cinema goers on 9th December, with ODEON Luxe Putney on 13th, followed shortly after by the newly re-named ODEON Luxe Haymarket, formerly ODEON Panton Street, on 14th December. Each of the cinemas will feature brand new luxurious handmade reclining seats across all screens, with increased leg room and personal space for guests, as well as retractable tray tables to ensure ultimate comfort. The New Year will also see ODEON Luxe Swiss Cottage become London’s first ODEON site to house an IMAX® screen complete with ODEON’s newly launched ODEON Luxe reclining seats. Guests visiting all sites can experience an overhaul of the technology in the cinemas to deliver an outstanding viewing experience. Each cinema will now boast new speakers and Dolby 7.1 Surround Sound across all auditoriums, as well as a new in-screen lighting system to help minimise distractions between guests. Hard of hearing or partially sighted guests can also take advantage of new Dolby Fidelio Audio Description systems and Hearing-Impaired loops across all screens. The launch of all three ODEON Luxe cinemas comes ahead of an exciting schedule of new films for guest to enjoy this festive season, including original musical staring Hugh Jackman The Greatest Showman (26th December), family-friendly animation Ferdinand (16th December) and the hugely anticipated epic Star Wars: The Last Jedi (14th December). Guests at each cinema can also enjoy a range of promotions and discounted screenings such as ODEON Kids, ODEON Newbies, ODEON Silver Cinema & ODEON Screen Unseen – as well as being able to take advantage of ODEON’s Limitless cards and ODEON Première Club loyalty scheme. Following a three-month refurbishment, ODEON Putney will re-open its doors as ODEON Luxe Putney on December 13th, complete with 333 fully-reclining, luxury seats across all three upgraded screens, with a host of food and drink options, including popcorn, nachos, hot dogs and all-new chicken strips. The cinema will also feature a new Oscar’s Bar serving a selection of alcoholic beverages, in addition to the re-vamped on-site Costa. ODEON Panton Street, will be re-launching on 14th December with the new name ODEON Luxe Haymarket. 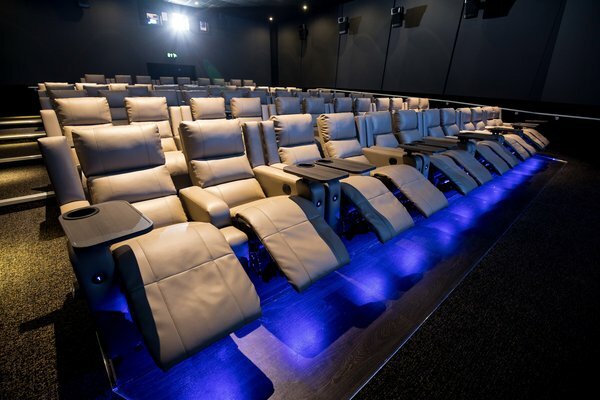 The cinema, renowned for its screenings of cult classics, Indie and foreign films, will be home to 182 fully reclining seats across all four upgraded screens. The cinema’s décor has also been given a refresh, with new carpets, fixtures and paint throughout. Fans of ODEON Swiss Cottage will be able to take advantage of the luxury ODEON experience from 12th December, when the cinema officially launches as an ODEON Luxe. All four standard screens have been upgraded, with 223 fully reclining seats and 12 new speakers throughout, while screens two and three have also been upgraded with enlarged screens for improved picture quality, providing the ultimate viewing experience. The cinema’s foyer and retail area have undergone a complete refurbishment with a new Oscars Bar serving a range of alcoholic and non-alcoholic beverages. • Early 2018 will also see ODEON Luxe Swiss Cottage become London’s first ODEON site to house an IMAX® screen, complete with ODEON’s newly launched ODEON Luxe reclining seats.